65th Square: Is The Chess Drum a Racist Website? Over the years, I have gotten tons of e-mail from chess players all over the world. The Chess Drum has been visited in nearly 200 countries and territories and has peaked at about 200,000 visitors monthly, a lot for a niche site. Most of the traffic outside of its American base is in Europe… Germany having the most traffic. The site is well-respected worldwide. 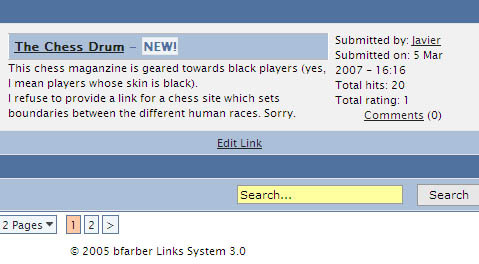 I once got an e-mail from a chap in England (in 2001) who stated that The Chess Drum was a racist site and mocked that I would not be able to find much information on Black chess. Well, nearly 6000 pages later, The Chess Drum is still beating and continues to show accomplishments by an obscure segment of the chess community. Since The Chess Drum was focusing on the Black segment of the chess-playing community, then it must be racist. I've heard this "reverse psychology" used many times in America (e.g., anything "all-Black" is racist), but let's check the logic before accusing me of being Bull Conner. There are hundreds of websites on the Internet on every conceivable topic known to man and woman. There are sites whose emphasis may be ethnic, gender-based, age-related; there are sites on topics such as nationality, religion, race or any multitude of social parameters. All of these sites seek to understand or highlight a particular dynamic relevant to that specific interest. Nothing dishonorable about this. The Brit ended his statement by saying the site was nice and that it was racist "in a good way." Is that a compliment? "I find your site very offensive and racist, and I think a lot of other people do also. But most of all, your site saddens me enormously. Is this what you understand by putting into practice Martin's Luther's teachings? I'm shocked. You're doing just the opposite." Regardless of what your purpose is, the fact remains that your site doesn't destroy boundaries, it creates new ones in a sport which has always been known for its universality regardless of age, race, physical appearence or any other feature which is used to devide people in other human activities. GENS UNA SUMUS, we are one family. I find your site very offensive and racist, and I think a lot of other people do also. But most of all, your site saddens me enormously. Is this what you understand by putting into practice Martin's Luther's teachings? I'm shocked. You're doing just the opposite. Your comparison with my country links doesn't stand to logic: those links are there to help people find information on chess in their given area and have nothing to do with race. As for removing the link to your site, there's no link, just a comment, and I believe I have the liberty to express my opinion and inform other people that such a site does exist. I understand your willingness to do something about the problems which affect the community of black chess players, but if I expected someone to do something about it, I assure you that it would be the complete opposite of what you're doing. In his letter, Mr. Gil tries to make building a respectable chess site analogous to something negative by his mischaracterizations. He also took liberty to judge and insult other chess websites on his link page. Racism is defined by Webster as "the belief that race accounts for differences in human character or ability and that a particular race is superior to others." While these issues can be (and have been) debated ad infinitum by scholars and pundits, nowhere on The Chess Drum are those arguments made. The fact remains… The Chess Drum is a chess site covering a veritable niche. Where could you possibly find any information about Black players before 2001? Why is this important? Because there are thousands of players in this segment who felt (and still feel) isolated from the general community. There are also racist notions that Blacks are not intelligent enough to play at high levels. On the racist stormfront.org, one Google hit on a Chess Drum page ended a foolish argument on whether a Black person could actually be a chess Grandmaster. Currently, the chess community lacks universality and it harbors notions that only a specific segment have made noteworthy contributions in its honor. There are so many wonderful stories being missed because many websites focus on the same 15-20 players and the same 5-10 tournaments. That is why there are so many chess sites highlighting specific social factors (e.g., gender, religion, ethnicity, nationality). Certainly, there are those who see The Chess Drum as the bane of harmony and unity because of its focus. A few people quietly shun its presence, but the vast majority will see the site for what it is… a site with unique content while extolling the beauty of chess. If one cannot see this and instead see it only as an exclusion of others, then they should do a check on their own racial insensitivity. When Gil stated that my vision was against Dr. Martin Luther King, Jr. and his teachings, he showed his naiveté. While Dr. King was an honorable man, my inspiration for The Chess Drum did not come from his philosophy or teachings. Gil's statement proved that he was misinformed about the plight of Black people and relegated it to a single (albeit important) point of history. It's strange how quickly people invoke Dr. King's name as if he were the only Black icon to make a contribution in the fight for social justice. rac·ism (ra'siz'um) n. The belief that race accounts for differences in human character or ability and that a particular race is superior to others. Dr. King was preceded by powerful Pan-Africanists such as Sylvester Williams, Hon. Marcus Garvey, Dr. W.E.B. DuBois, Hon. Elijah Muhammad, Dr. Kwame Nkrumah. These men all came before Dr. King and laid important groundwork for Pan-African principles. It is the principle of Pan-Africanism that is the inspiration for The Chess Drum. The website remains dedicated as a vehicle for inspiring people of African descent and informing the general chess community. The overarching theme is that chess is a universal activity in which Black people are an integral part. To have a sport where only two segments (Europe and North America) remain the focus negates the broad appeal of chess. This situation contributes to the failure of attracting sponsorship for chess development. If the true face of chess was shown, then sponsorship may grow in developing countries. "I understand your willingness to do something about the problems which affect the community of black chess players, but if I expected someone to do something about it, I assure you that it would be the complete opposite of what you're doing." In my response, I asked Mr. Gil what he would suggest as a solution and got no answer. The reality is those who cannot see the need to highlight Black chess accomplishments, harbor racial insensitivities they would not admit to. Sites like The Chess Drum say more about the success of chess and its universality than anything else. Oftentimes, I get e-mail from around the world telling me they had no idea Blacks were involved in chess at such a level. Many are appreciative and move forward to provide tips. In the past, I have gotten tips from random enthusiasts telling me about people such as Rogelio Ortega, Pontus Carlsson and Benjamin Bujisho. These players would not normally see the light of day, but at The Chess Drum, they get the recognition they deserve. Perhaps Mr. Gil is perfectly fine with a magazine or website having a 95-100% focus on Europe and North America (like his own), but not a website with a similar emphasis on Pan-African chess. He stated in the letter that he wanted people to know such a site exists, yet he refused to include the link. What's the point? One wonders the real reason why Mr. Gil refused to provide a link to The Chess Drum. Is he afraid to let people determine the truth for themselves? Perhaps Mr. Gil has some racial insensitivities of his own.